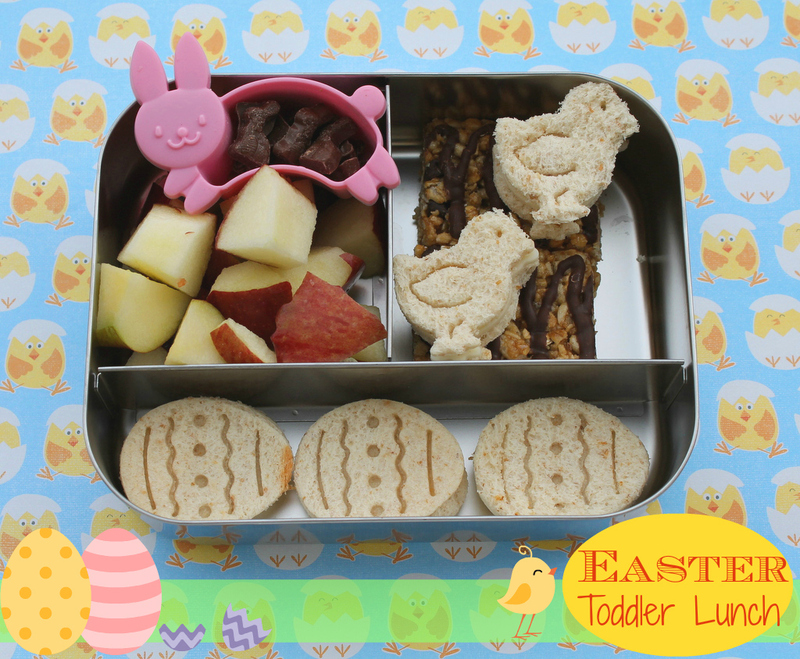 A quick post for a quick and easy Easter Toddler lunch! We made had a busy day and I made my daughter a quick lunch to go. We packed cheese sandwiches shaped like Easter eggs and Easter chicks with help of the cute plungers below, and also had apples, a cereal bar and bunny shaped chocolate chips. We packed a celery and carrot garden, oranges and two shaped peanut butter pockets. I also found a sweet Lunchbox Love Card to match our Easter theme! The other lunch we packed were a left over cinnamon roll, oranges and two oven baked pancakes. They also packed a mini dipper with syrup and a Chobani Champions Banana Honey yogurt. Easter breakfast in Easylunchboxes! Time was not on my side this morning and we had to make lunches fast. Everyone was helping and instead of the lunches I had planned we ended up with a quick Panda and a quick lamb lunch on the fly. We packed CuteZCute Panda sandwiches for my 5th grader in our Easylunchboxes with sunflower seed crackers, carrots and celery with ranch dressing (in the panda cup) and popcorn. I also packed ice water and a frozen Chobani Blueberry tube (not pictured). We packed a simple bento box with bunny sandwiches, celery, carrot flowers and cheddar bunnies. And to make lunch more fun today we added a Lunchbox Love Card and two bunny rings. Today we are featuring Fun To Eat Fruit in our Favorite Subscription Boxes Series and as a bonus you can win some delicious fruit delivered to your door step! Courtesy of Fun to Eat Fruit! As I stated in Part 1 of our series, I love getting fresh healthy snacks delivered to my door that I can feel good about giving to my family. And freshly picked fruit is as healthy as it gets! Fun to eat Fruit is a family-owned business in New Hampshire dedicated to encouraging healthy eating habits for both kids and adults. They deliver delicious fruit all year long and you can see their fruit calendar HERE. They are not a subscription service you have to sign up for. You can just order fruit through their website as you please but I wanted to include them in this series because I love the idea of fresh fruit delivered to your door as a healthy snack - delivered in a box! They generously sent me two tubes of apples to review. 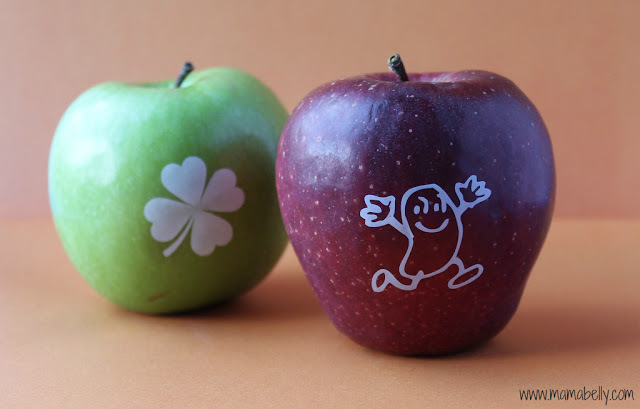 Granny Smith apples with a clover motive and Red Delicious with a funny bean motive. The apples were carefully packaged in tubes (which are eco-friendly! These are great for storing anything from paper clips to pens and coins or you can recycle them of course). Or you can store seasonal bento supplies in them like I did! I love reusing things and finding great storage solutions for all my cookie cutters and decorations! But back to the apples! When I opened the tubes of apples the aroma escaping was amazing and the apples taste just the same - wonderfully delicious. Plus, all the apples looked beautiful as well. They come pre-washed and ready to eat and all you have to do is store them in a cool place or the fridge in their tube. We had ours for 4 weeks and are just finishing up the last apple today and it tastes, looks and smells just as fresh as the one we ate the very first day! You can buy 8 pieces of fruit - delivered in two tubes for $12 or up to 8 tubes with 32 pieces of fruit for $48 plus shipping and tax. A great addition to our snack rotation and the taste and freshness was superior to anything I am able to buy in stores in my area! 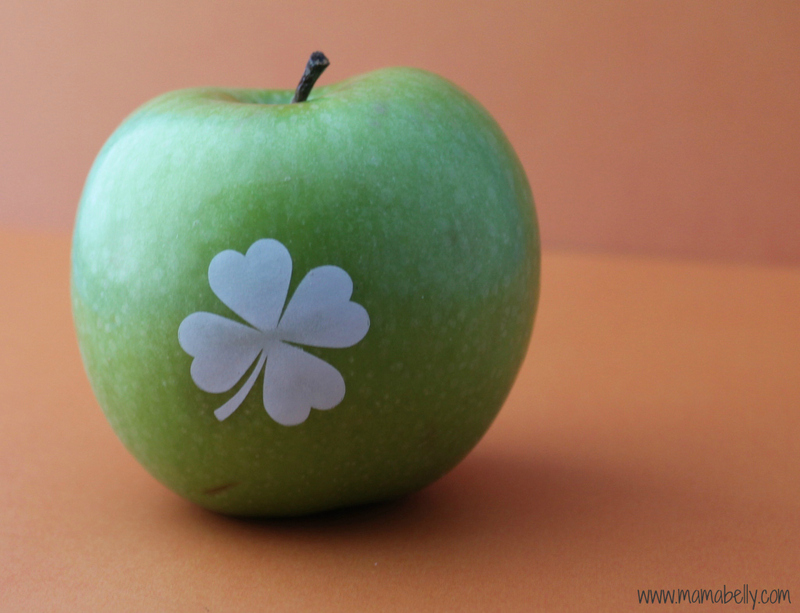 I love Granny Smith apples and these were so tart but also sweet enough for my kids to love them as well! We really loved their taste and they were gone fast! Aren't they just the perfect addition for lunch? We also received juicy Red Delicious Apples and they were crunchy, juicy, sweet and had the fresh from the orchard taste we all love! Plus, the funny bean made my kids giggle!! 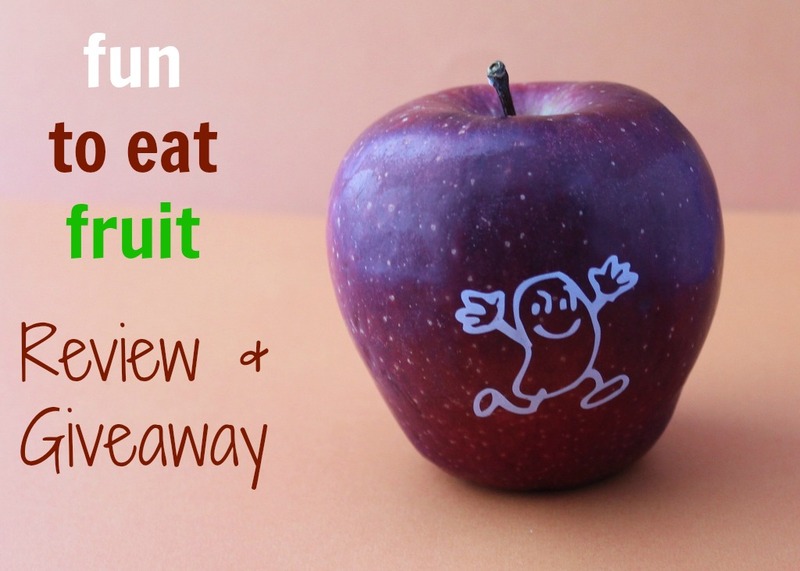 At the end of the post you can win some delicious Fun To Eat Fruit to try yourself! Today's lunch includes half a Red Delicious Apple with Funny Bean motive that matched my "Spring into Spring" lunch perfectly! We also packed cheddar bunnies, a peanut "bunny" sandwich and some celery grass with carrot flower. One happy spring lunch! Fun To Eat Fruit generously offered to send one of my readers a 16 piece prize pack containing 8 pears and 8 apples with fun motives! All inked images are edible (of course) FDA approved and kosher! The perfect snack to keep going after a busy morning! a yummy Pumpkin cereal bar with green pumpkin seeds. Three more days until St. Patrick's Day! 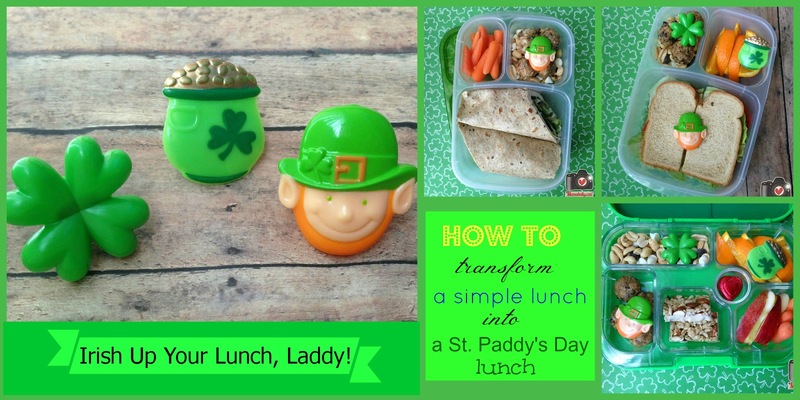 We cannot wait for corn beef and cabbage and are happy to have a couple more days to pack a lot of clover and green in our lunchboxes! We packed our yubo today filled with a corn muffin with fruit leather detail, some No Bake Oatmeal Cocoa Cookies from yesterday, two clover shaped sandwiches with green dye-free tortilla and mayo and mustard on the side and some home made clover shaped Ritz crackers. Home made Ritz Crackers you say? You think they were extremely hard to make, took hours to bake and are only to be attempted on a long weekend? Wrong! I found the recipe for the home made Ritz crackers on Instagram. The very talented Stefanie Newcomb (aka @stefanienewc) posted the recipe. She is an amazing belly, birth and baby photographer (find her website here) and also happens to make amazing lunches and food art (check her Facebook!). Well, and she posted a short, simple recipe and had me intrigued. Combine all in food processor. Roll out as thin as possible and cut out with cookie cutters. Bake 10-12 min at 400 degrees. After baking brush with some melted margarine and salt if desired. The other night we all wanted needed cookies after dinner and I was browsing the internet for a simple and quick cookie recipe when I found these delicious sounding Oatmeal Cookies from Quaker Oats. Simple ingredients. No baking and done in under 3 min. Yes! Yes! and Yes! And they were delicious but too sweet for my taste. How could they not with 2 cups of sugar in the recipe. However, I did not want to give up on them since they were so simple, so good and had ingredients that I always have on hand. So I decided to make a healthier version and try and see how they would come out. I cut the sugar in half and replaced the white sugar with light brown sugar and swapped out the butter with margarine. Well, and added a few things. Look at these cookies. They were even better! My family - yes, including the kids - liked the new version better since it tasted more like cocoa and we all agreed the first cookies were just too sweet. Lay out parchment or wax paper for cookies to cool on. Add brown sugar, margarine, milk, and cocoa to a medium sized pot and bring to a boil. Continue to boil for 3 min under constant stirring. Remove pot from heat and add quick oats, slivered almonds and 1/4 cup of mini chocolate chips to the pot and vigorously stir until all ingredients are well combined. 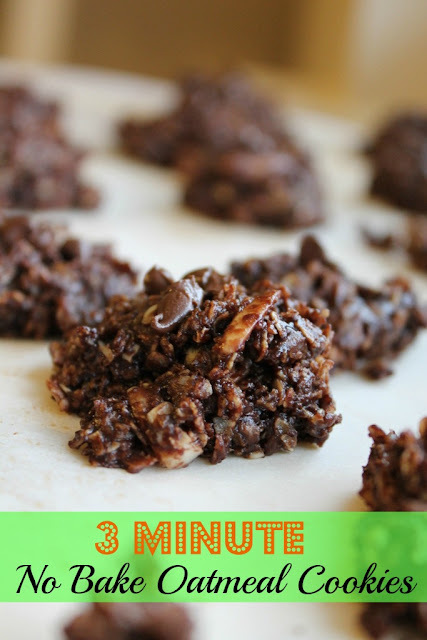 Immediately, using a teaspoon, spoon mixture onto parchment paper - just like cookie dough. Top cookies with a few mini chocolate chips each and enjoy. 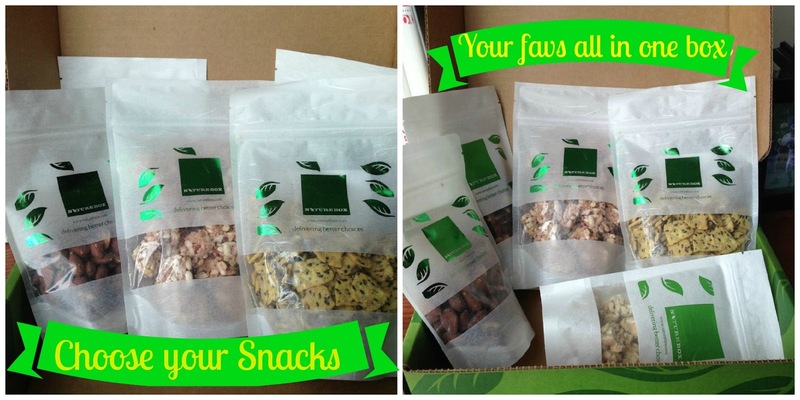 I love Snack Subscription Boxes. I really do. They are convenient and make it to your house even when you don't make it to the store and there is always something everyone likes. Especially me. I mean, I just love to open my door and find a box of healthy delicious snacks on my door step that I feel good about giving to my family. 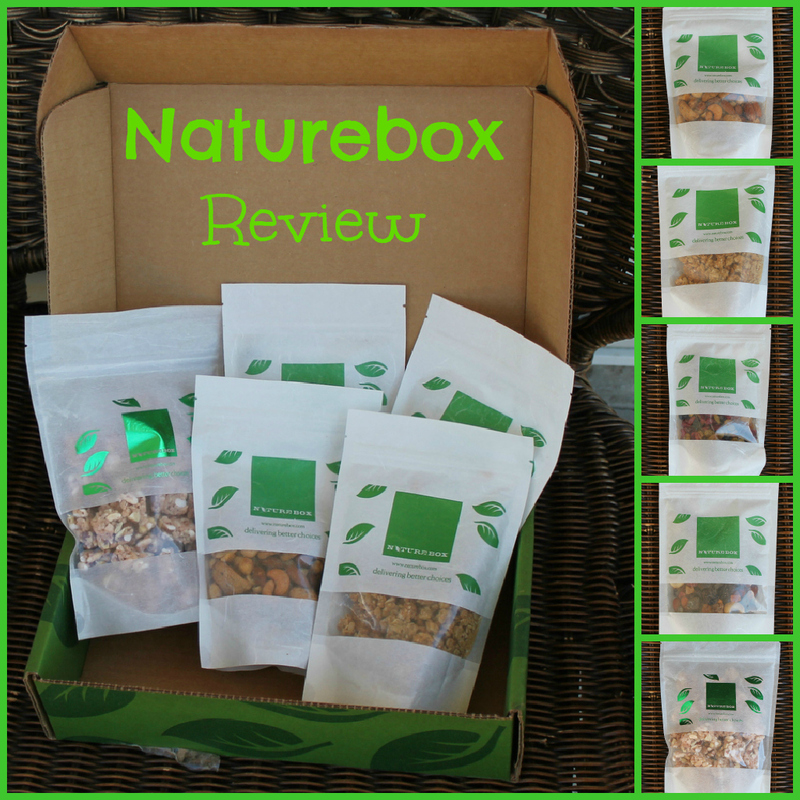 Naturebox is a monthly subscription box that provides you with 5 full sized snacks for $19.99/month. Their snacks are made with wholesome ingredients and are minimally processed if at all and they are simply good delicious amazing. 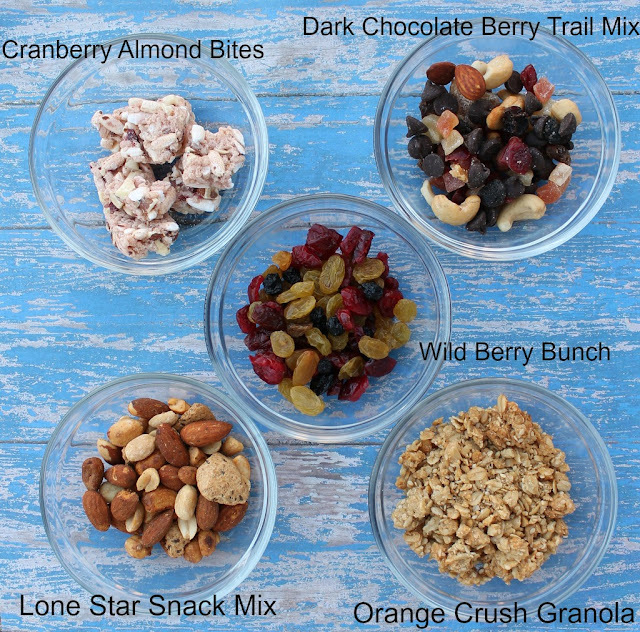 So what are examples of Naturebox Snacks? You can see them all HERE and the above pictured snacks were in my January box! We loved them all without exception and have already ordered some of them in our Choose Your Own box again! Dark Chocolate Berry Trail Mix, yum! 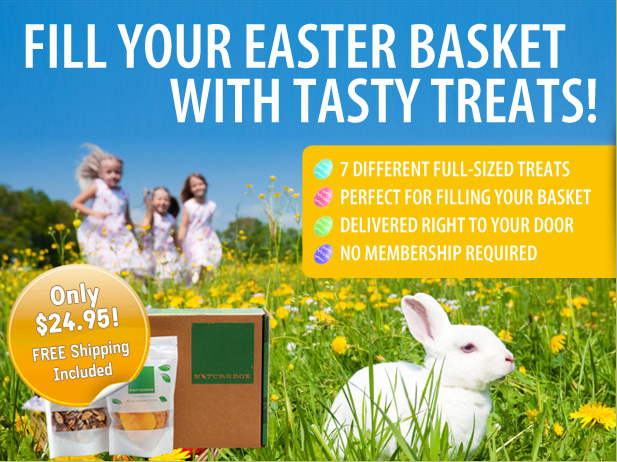 And for Easter NatureBox is also offering a great 7 snack deal so you can share with everyone in your family and maybe even friends and family from out of town without having to become a member!! 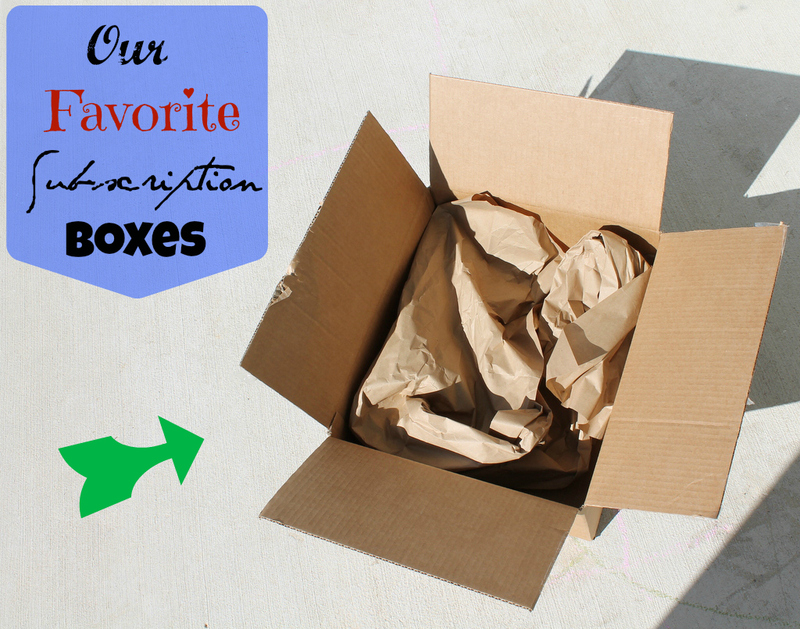 It is a one box deal and a great way to see if you love NatureBox as much as we do! We love Naturebox and my kids love finding Naturebox treats in their lunchboxes! Look for Part 2 of our series about Subscription Boxes next week! I wanted to show you today how easy and it is to transform a regular lunch into a St. Patrick's Day themed lunch with minimal decorations and basically no extra time. All you need is a few St. Patrick's Day cupcake rings. I bought mine from a friend who lives near a cake decorating store but if you don't have one nearby these are also available on Amazon (links below the post). Same with our yumbox: The food is simple: No bake energy balls, a cereal bar cut in half, apple slices and some mini carrots, oranges and the same home made trail mix plus the three cupcake rings. I even added a special touch to my husband's lunch today. He has the trail mix, energy balls, carrots as well and a chicken with salad wrap. Even just one small decoration can make this lunch more special. We have made an effort to ban all juice boxes, baggies and pre-packed snacks from our home although as a busy Mom I am certainly not always perfect. 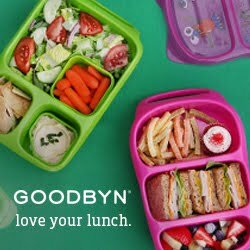 The Three-in-One ECOlunchbox is a great lunch box and definitely has made it's way into my favorite lunch boxes to pack stack. And I am very exited that ECOlunchboxes has agreed to send one of you the Three-in-One as well! Enter my giveaway below for your chance to win! ECOlunchboxes are stainless steel lunchboxes made in India. They are dishwasher safe, food safe and lead free. The Three-in-One Lunchbox consists of three parts which can be used separately as well. The bottom layer is designed to fit a whole sandwich, the second tier is perfect for cut up fruit, veggies, salad or pasta and the small inner box is designed to hold 1/2 cup of wet foods like thick applesauce, fruit or salads. I mostly use the small inner container for nuts or snack mixes since there is always a chance of leaking when the box is jostled since it is only pressure fitting and not 100% leak proof. My boys are not always very gentle with their lunch gear and to avoid accidental spillage I only pack really moist food when I use the box. I packed some for myself the other day and it was great for thick homemade applesauce! I have grown quite fond of the small inner box and often use it for a quick snack on the go or to pack food my kids like separate from the other food like cheese or filled crackers. 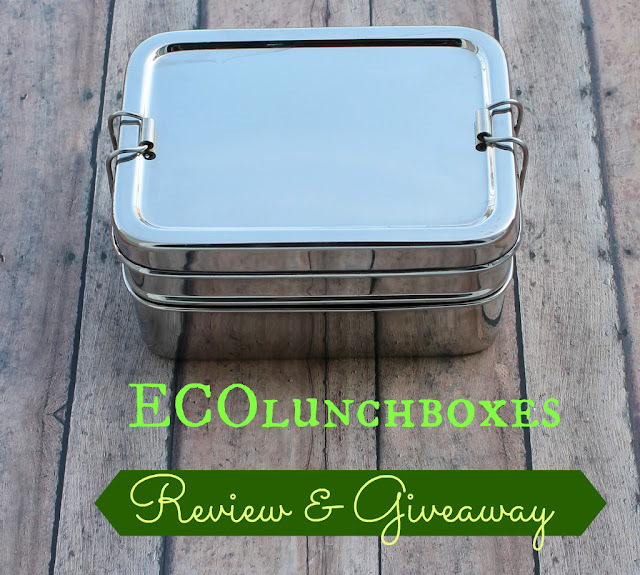 Overall, I think this is a great lunchbox for all stainless steel loving lunch packers out there and I love the versatility and separate use possibilities of the small container and top layer. The only two things to consider are that the small inner box is not 100% leak proof and the container does not seal completely which makes it not a great container for packing lunches far in advance since air does get in as you can see in the first picture. Here is your chance to win one and try it all out for yourself!